I was born in Columbus, Ohio. My parents were divorced. My mother was on welfare. She cleaned houses. She had four sons, and I am the oldest. The oldest is always the aggressor. We lived in public housing in Poindexter Village, one of the first public housing units in the United States. It is still there today. It still looks the same. When I go back to Columbus, I drive by just to look at it. And I think about those days. So growing up was rough. My mother used to rob Peter to pay Paul. From that experience, my brothers and I were determined we would never utilize a pawnshop to pay the utility bill, because my mother did it. She would pawn things, and we would help get them out. We had a newspaper route, and we made our own money. From the newspaper route, we won contests to travel. That gave me the instinct to want to see more than Columbus and to travel. It was 1964. The racial climate — well, we’d seen better days. But I came to get an education, and they said LeMoyne was a good school. I got on a Greyhound bus with two pork chop sandwiches that my grandmother made for me, and I rode to LeMoyne-Owen College with no dormitory. I stayed with a woman on Walker Avenue, and the rent I paid was $1 per day. I got a work-study job, so I paid for my own tuition with that. I began to love the school and to love Memphis. I went through a special summer program at Columbia University in New York City for minorities in broadcast journalism, created as a result of the 1968 Kerner Commission that suggested — after the death of Martin Luther King — that we needed more diversity in broadcast journalism and journalism in general. So they started training people, and I came to Channel 5 and stayed 12 years. As a reporter, I covered City Hall. I said, “I can do a better job.” In 1983, I left Channel 5 and ran for the Memphis City Council, and I ran at-large. At that time, it was unheard of: No African-American had ever been elected at-large. But I said, “It’s time.” Bill Gibbons defeated me by 9,000 votes. Needless to say, I was discouraged. But, if you want something, you go after it. Four years later I ran again, at-large. On this one, I was confident because I only had one challenger, a housewife and former principal. Her quote in the paper was, “I’m running for the council because I don’t have anything better to do.” Little did I know that Florence Leffler had a husband who had just departed the Earth, and he was very well-respected. She trounced me — 20,000 votes. Meanwhile I was teaching school and working as Harold Ford Sr.’s press secretary. In 1991, I started a 17-year career at FedEx in corporate communications. Also in 1991, nobody was challenging Andy Allisandratos for the City Council. I was not going to give him a free ride. Well? I beat Andy by 20,000 votes. That was the year the city elected its first black mayor, Willie Herenton, and everyone was coming out. Since then, I’ve never looked back. I’ve been elected to the council five times, and that is really historic. I’ve been here 17 years now, and this is my second term as chairman. 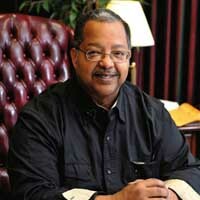 I am the second longest-serving African-American in the history of the council. Who was the first? J.O. Patterson Jr. He served for 20 years. And I was elected two and a half years ago to the Memphis Charter Commission to overhaul the city’s charter. So I’ve been elected six times, and I’ve been very fortunate. I knew I had it made when … I don’t have it made yet, and anyone who thinks they have has reached the top of their game and won’t go any further. Every day brings new adventures; every day brings a new learning experience. I have reached higher than I thought I would ever reach and achieve in political service, but I don’t have it made. The most difficult thing is trying to balance the needs of our community with the diverse views expressed in the community, trying to come out with a cohesive statement from the council on a wide variety of issues, and maintaining a balance and respect for individual ideas even when those ideas differ from yours. Success is a life’s journey. Success is what you feel it is, but I think everyone has the potential for greater success tomorrow than they have today. It’s ongoing. It’s important to remember that we’re put on Earth for only a short period, and we’ve got to pave the way for others. When my first child was born … Mickell, my son, is the joy of my life. I gave him three rules for college: 1) Make at least a C average; 2) Don’t get on drugs or liquor; 3) Don’t get anyone pregnant. As long as you do those three things, you’ll always have me. He did that and more. Now he’s a grown man and he’s living his life in a model way, and I’m extremely proud of him. One of the worst days of my life … I probably have not experienced the worst day of my life yet. It is still to come. A career in politics is rewarding. It should be the goal of many people to do their part to help make our community better. The greatest joy is when people understand what you do and why you’re doing it. It’s rewarding when people say, “Keep doing what you’re doing. I agree with your philosophy.” That gives me joy. If I had a magic wand, I would eliminate the word “race” from the vocabulary of everyone in Memphis and Shelby County because race has been used as a crutch by both communities, black and white. Dr. Martin Luther King Jr.’s words of pulling yourself up by your own bootstraps are real. With hard work, dedication, minus drugs, you will be successful. Eliminate “race” and see how many arguments we have then. I have never been drunk. The most important thing in life is being true to yourself, being honest, living a good life, helping somebody else, giving back to your community, paving the way for others. I wouldn’t be where I am if it had not been for the inspiration of others. I stand here on the shoulders of someone who paved the way for me, and I never forget that. It goes back to the J.O. Pattersons and the Reverend James Netters of the world. It is now my obligation to make it easier for somebody to take my place. When your job is a public servant, you have to be aware of your public image and not do stupid things. We are held to a higher standard, and we must maintain that higher standard, maintain ourselves with dignity in the community. Walk the walk and talk the talk. People don’t realize how stressful it can sometimes be as a public servant trying to balance the needs of everyone in the community. You can’t please everyone, and you have to accept that. We make hard decisions, we do the best we can, but then we have to move on. As chairman of the City Council I try to respect the differences of others on the council and not take it personally, because when you take it personally, that’s when you lose your effectiveness in terms of what the overall goal is, and that is to do whatever is in the best interest of all of our citizens in Memphis and Shelby County. The most important lesson I’ve learned is to speak less and listen more. I learn from others every day, and the opinions of others help balance my ideas and work them into what I think is a more acceptable framework for what I’m doing. I’ve learned I’m not always right. It was a hard lesson to learn. I pay a personal price when I eat junk food. I realize it’s a lifestyle change that I need to make. If I could make one change in the world (sings) I’d like to see the world as one in peaceful harmony! (laughs) That’s an idealistic situation, but if we could do that, think about how much better the world would be without a lot of dissension. I’ll never forget a lesson that took me a long time to learn: Relationships are better than money. Relationships make the world go around. If I could do one thing over … I don’t have any major regrets in life. Everything has been a learning experience. The greatest honor was being selected by the U.S. Jaycees as one of the Ten Outstanding Young Men in America in 1983 based on my work in broadcast journalism. I did a show on the Mound Bayou Hospital in Mississippi. It was the only hospital in rural Mississippi that took care of indigent patients, and it was closing. I interviewed those patients, and my documentary helped keep the hospital open. That honor put me in the company of people like Elvis Presley and Orson Welles. Above everything else trust your instincts. My final 2 cents is that more people should be encouraged to go into public service. More people should prepare themselves for my job, for your job, and for a variety of jobs in this community — and they only do that through education, hard work, and staying off drugs. We’ve got to look out for one another. You need to do something to help make our community greater. That’s what I tell folks: Do something.